Pictures and information on the amazing French capital. 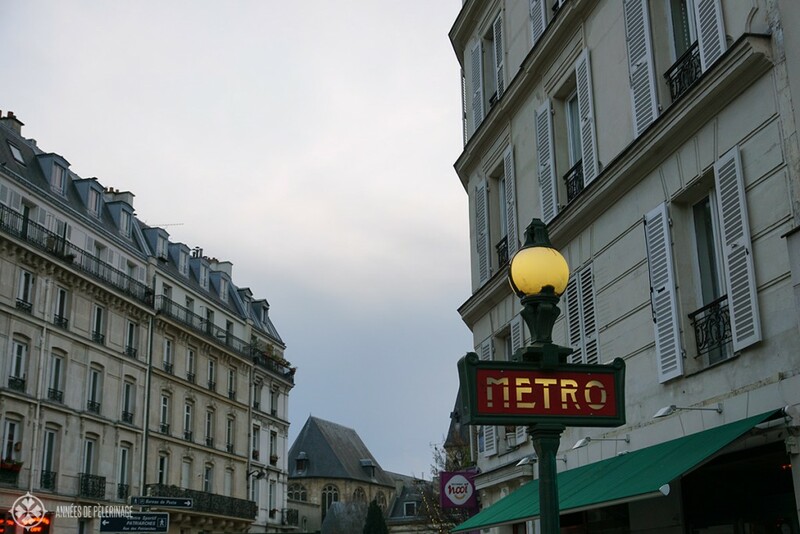 Find out my favorite things to do in Paris. Paris is truly one of the most spectacular cities on this planet. Art, culture, fashion, parks, food and beautiful architecture – there literally is no aspect of France’s ancient capital I don’t like. No, make that a ‘love’! Like an unrelenting gravitational well, its many attractions pull me back towards discovering more layers of the city of lights each year. In all honesty, I truly lost count on how many times I have visited Paris. Yet the city never ever bores me – the possibilities are almost endless. For someone who is visiting Paris for the first time, the city can be a bit overwhelming. So I decided to share my favorite 20 things to do in Paris. I also compiled a list of the 10 most amazing photo locations in Paris, so make sure to check them out. I really have to stress that these are my personal favorite things to do. Paris is a city of many wonders and attractions and there are probably over 1,000 different ways you can spend a weeks’ worth of time. 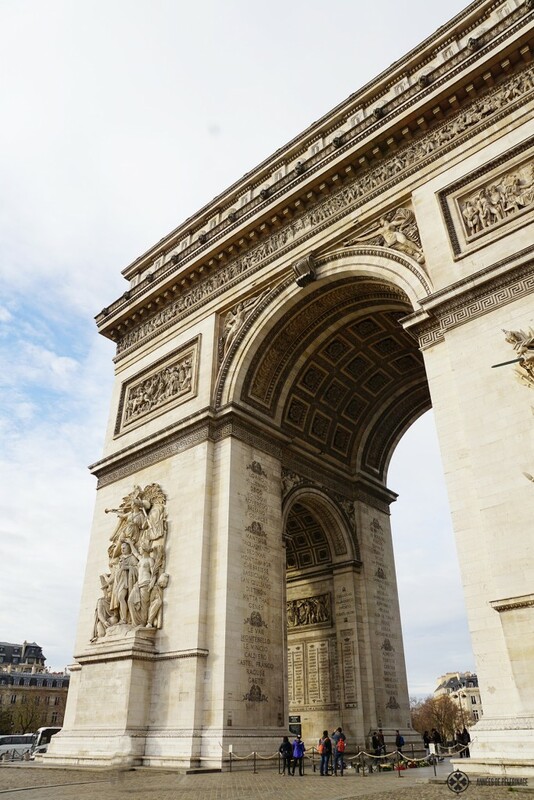 This list is far from extensive, so if you would like to share some of your favorite things to do in Paris, make sure to drop me a note down in the comments. Also make sure to follow me on Instagram, as I am regularly sharing pictures from Paris. I also got a well-curated Pinterest board for Paris I am sure you will find super helpful. Either way, here we go! My single favorite thing is probably gazing at the Eiffel Tower. There is a reason why it is the most visited paid monument in the world. I guess when most people are thinking of France they will probably have an image of the Tour Eiffel, how it is called in French, in mind. Built in 1889, there really is no way around dropping by. If you want to go on top to enjoy the view, absolutely make sure to buy your tickets in advance (you can do so online). Otherwise, waiting times of around 2 hours during the peak times are very common. The tower will be open late into the night (in summer until midnight). I do recommend you to go as late as possible for two reasons: There is less of a crowd AND for me, the view at night is so much more spectacular. Much like all the other metropole areas in the world, the sky above Paris is often very smoggy. At night, on the other hand, you can truly appreciate why Paris is called ‘the city of lights’. Here is the link to buy the official tickets. The Louvre…I am not even sure I can explain the many fond memories and priceless moments I connect with my visits to the Louvre. 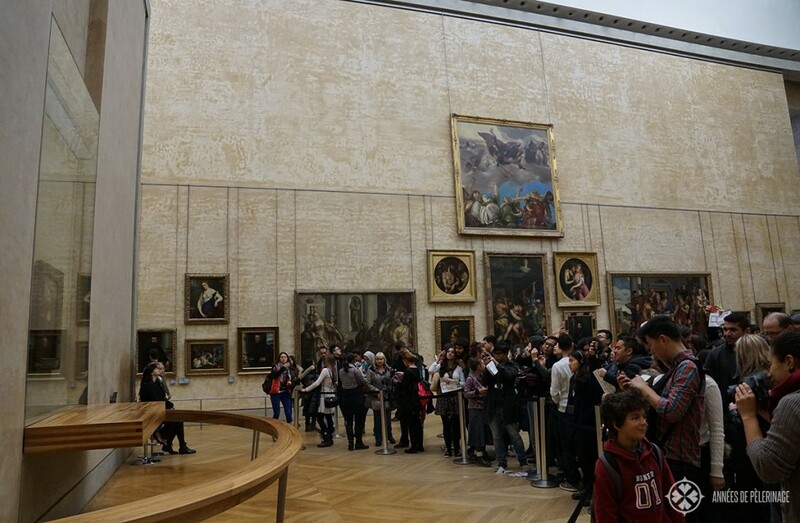 With 9.26 million visitors in 2014, it is the single most visited museum in the world. 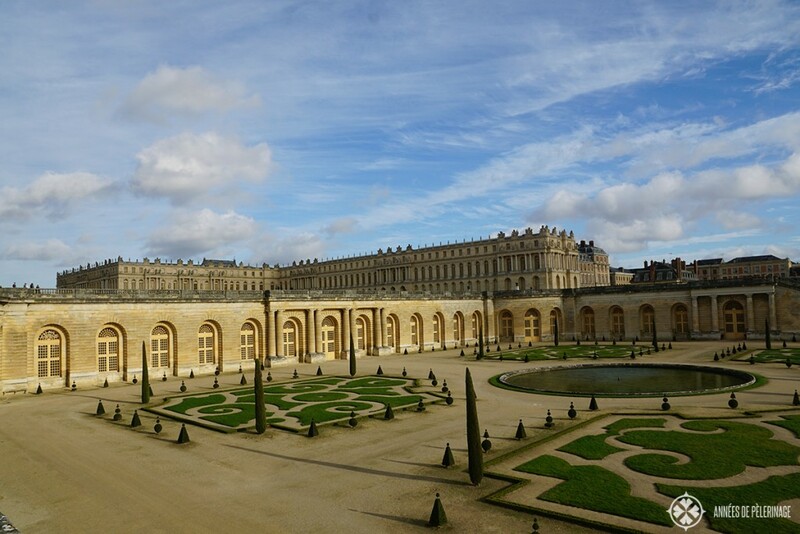 Originally a fortress and the palace of the French Kings, it essentially has been a museum ever since Louis XIV moved to Versailles. You should not go, because it is so famous, but rather because of its outstanding collection. 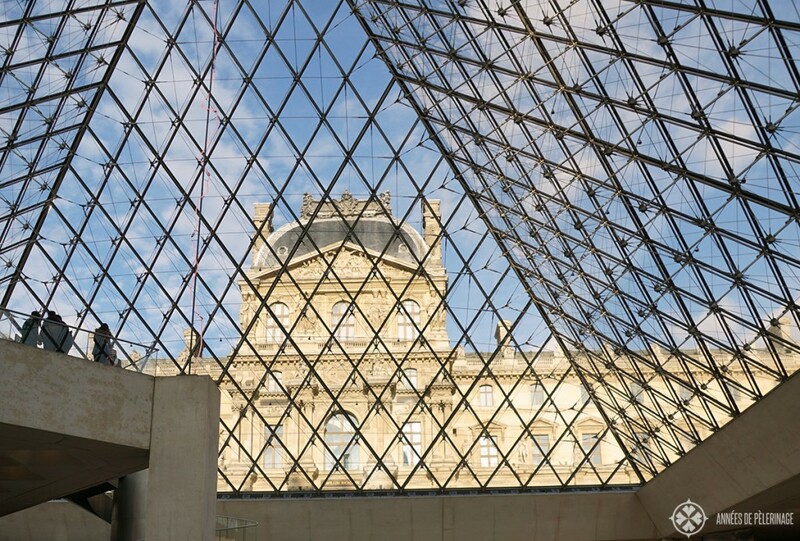 Paintings and drawings starting from the dawn of time, sculptures and decorative arts – the Louvre really cannot disappoint. Be, however, prepared for a crowd! 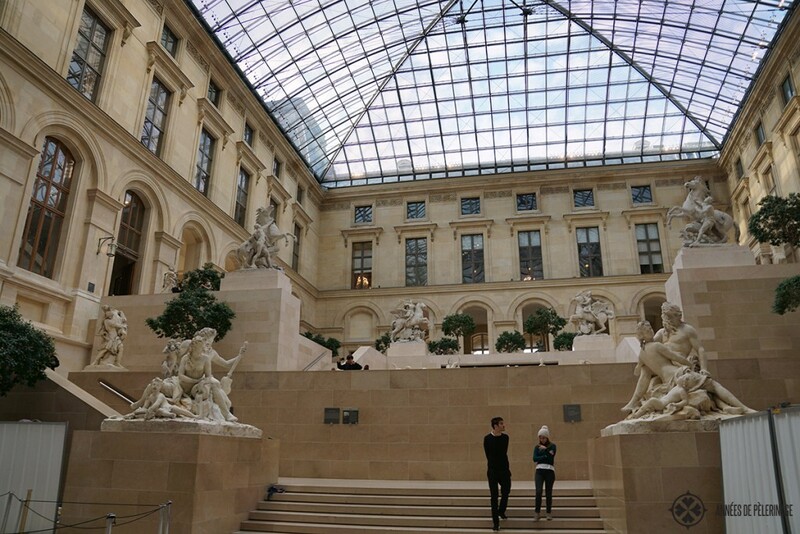 Also, know that you will easily be able to spend a whole day at the Louvre. In fact, a week is probably not enough to appreciate it all. If you are in a rush, plan out your visit ahead and only concentrate on a few highlights – otherwise, you will collapse from a sensual overload. But don’t be too disappointed when arriving at the Mona Lisa. While I was able to see the famous painting by Leonardo da Vinci close-up in the early nineties, there is a big exclusion zone around the priceless artwork these days. So the whole experience is a bit underwhelming. Personally, I love watching everyone trying to get their less than perfect selfie with her. 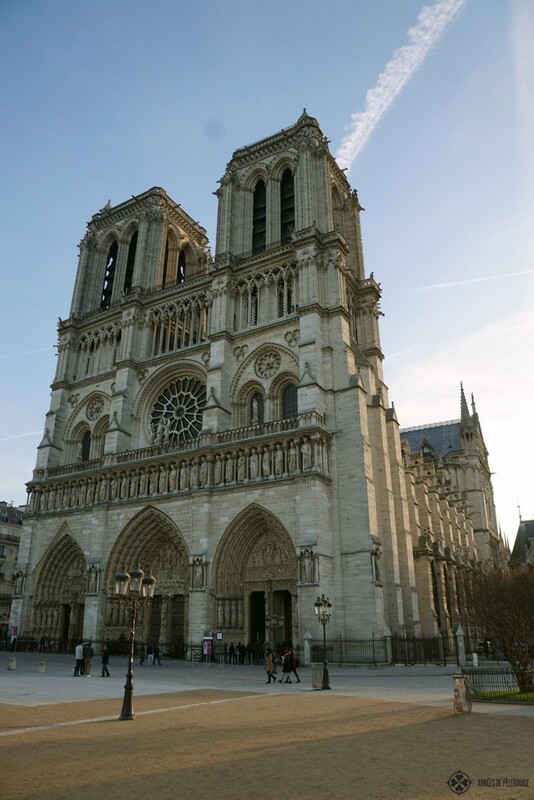 Another iconic landmark of Paris is Notre-Dame de Paris. 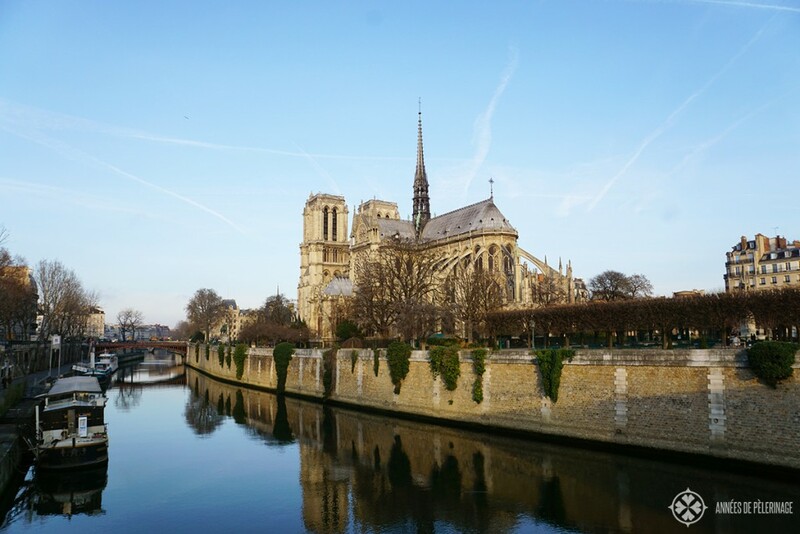 Located on the Île de la Cité, the very origin of Paris, the ancient cathedral will impress you with its sheer size. The inside is rather austere, save for the stunning stained glass windows. You can climb to the top and enjoy the beautiful view from this spectacular gothic building finished in 1345. 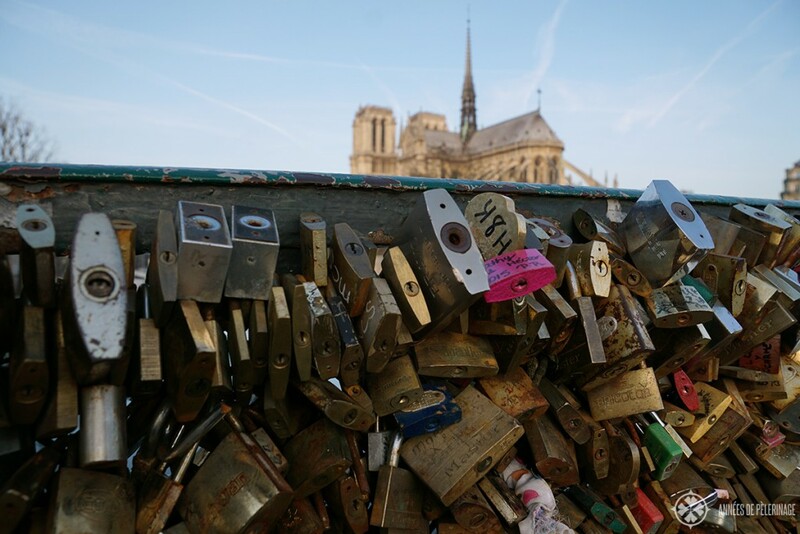 Make sure to enter or leave via the Pont de Larchevêché where a lot of love-locks can be seen. The best time to visit is very early in the morning, in my opinion. 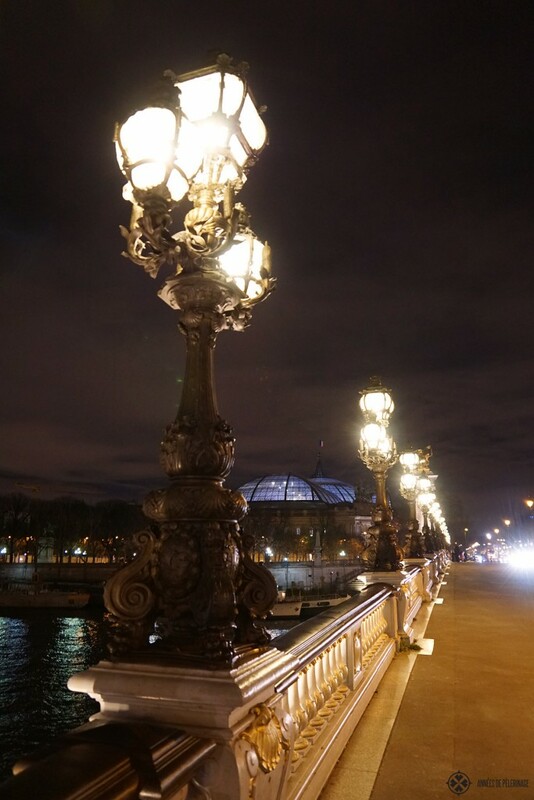 Again there is less of a crowd, but also the light along the banks of the river Seine will be magical. Or go late at night and attend a mass. I once went on Christmas Eve and it really was a very spiritual experience. If it is a big event, make sure to come an hour or so in advance. Notre-Dame will be absolutely packed on these days. The music (organ & choir) will be well worth the wait. 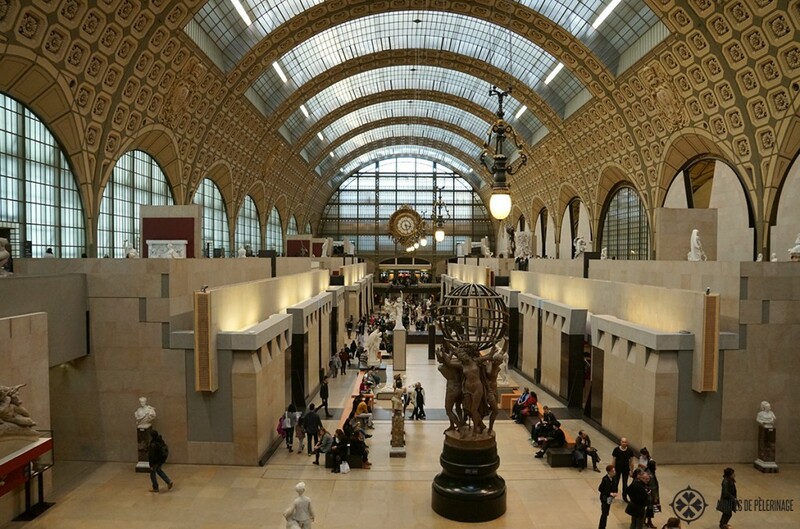 What the Louvre is to ancient art, the Musée d’Orsay is for modern works. 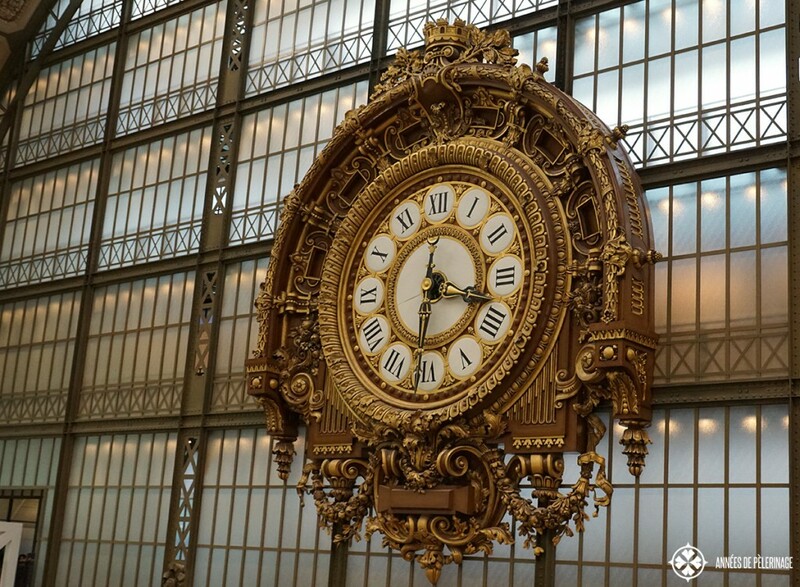 Located inside an old train station, the museum equally fascinates through its outstanding architecture and the vast collection of Impressionists and post-Impressionists. Monets, Manets, and Van Goghs – you will be dumbstruck by the sheer amount of masterworks. Very famous is also the clock by Victor Laloux in the main hall. For me one of the most beautiful clocks in the world. 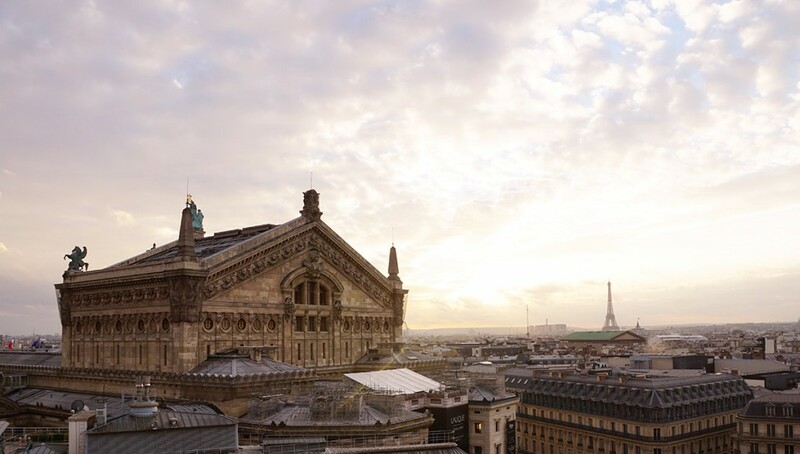 So do put in on your list of things to do in Paris. 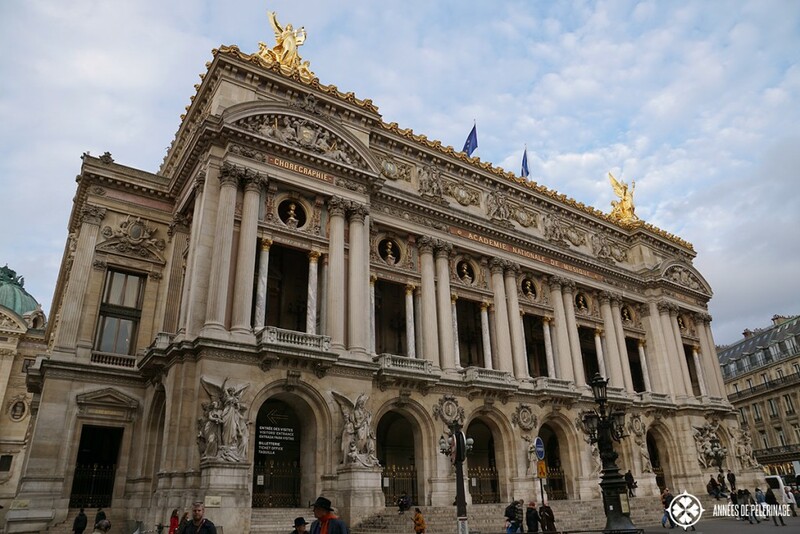 The Opéra Garnier, or more precise the Palais Garnier, is one of the most famous Opera houses in the world. It is certainly the largest and most impressive one. It is a golden masterwork and a sublime temple for music. It is equally as stunning from the inside as it is on the outside. You can visit during the daytime on self-guided tours (buy tickets here). I do recommend you to actually book a ticket for a performance at night. 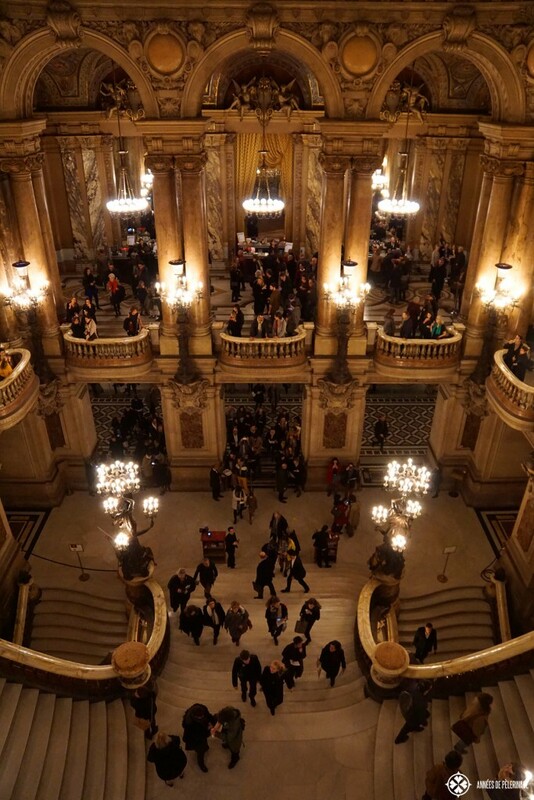 “Only” ballets performances are staged here. Most operas (other than a very selected few classical ones) are performed at the Opéra Bastille these days. But since French ballets are world renowned, you can hardly call that a fault. Absolutely make sure to visit the grand ballroom. 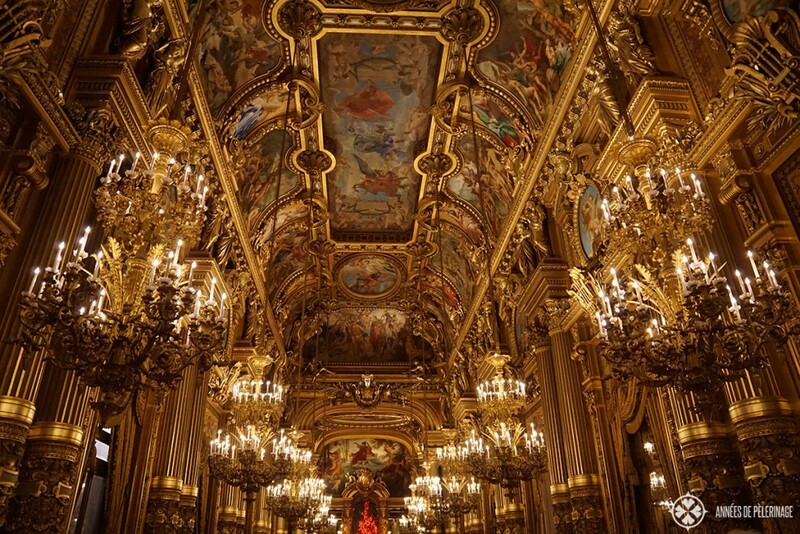 The golden splendor and the huge chandeliers will make you gasp and gasp out loud. I never attended a ball here, but each time I visit, I imagine what it would be like to dance away an evening surrounded by these sparkling riches. 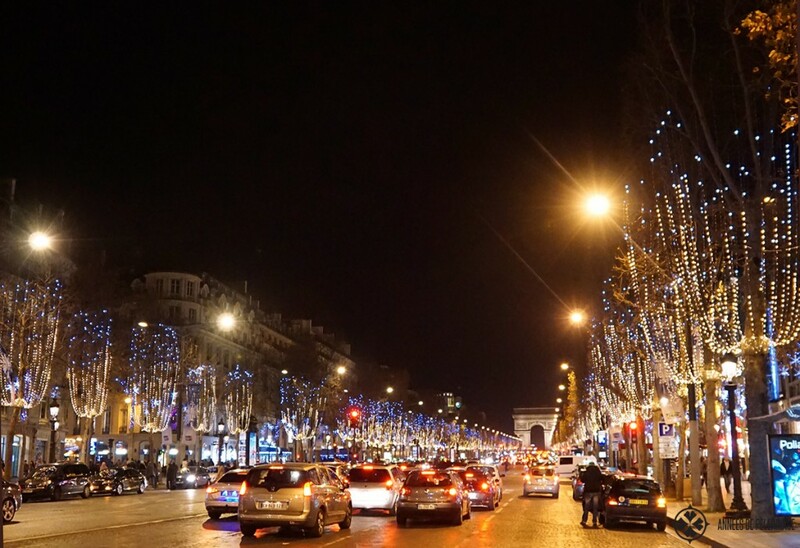 The Champs-Élysées might just be one of the most famous boulevards in the world. With a length of 1.9 kilometers, this is where the annual military Parade on 14th of July is held (Bastille Day). Go here, for the many shops, cafés, and theaters lining the street. 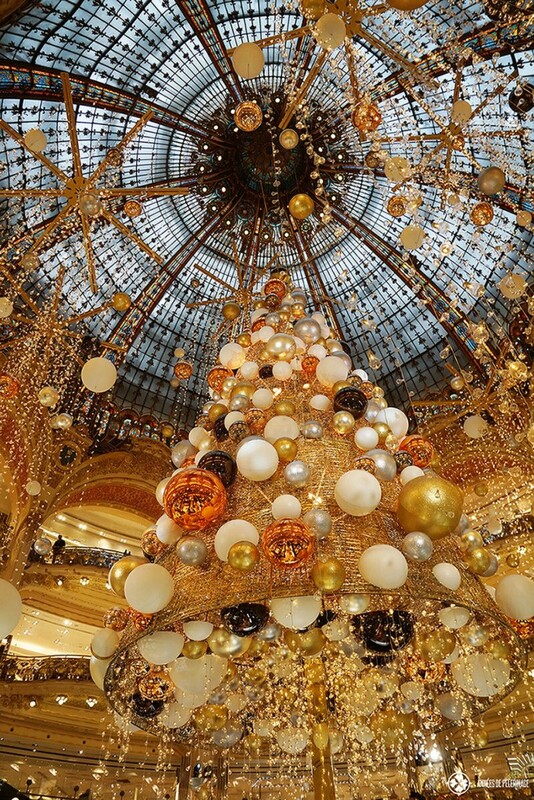 The best time to visit would be around Christmas, where one gigantic Christmas market is filling the lower half of the Champs-Élysées. I actually don’t think this is a good place for shopping or having lunch. Other quartiers of Paris would qualify more as any local would attest you. But I love to breathe in the cosmopolitan atmosphere and watch the people from all over the world going about their things. The Arc de Triomphe de L’Étoile is the second most iconic monument in Paris. 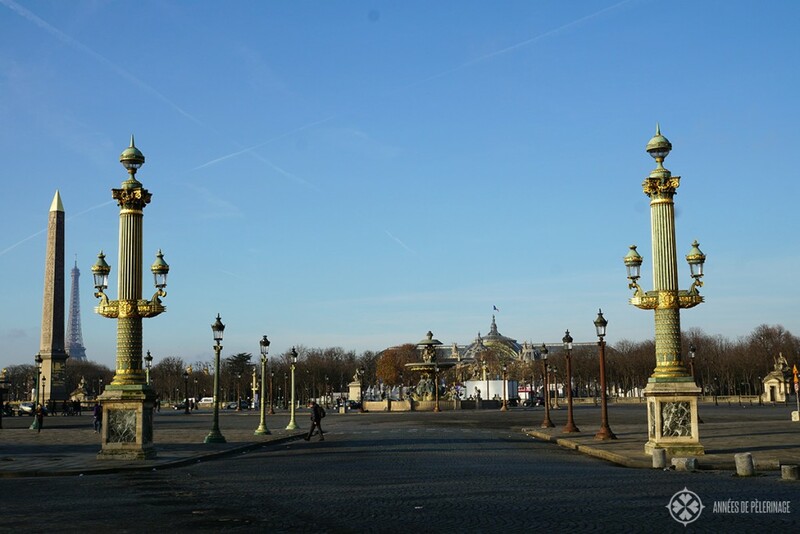 You’ll find it at the very end of the Champs-Élysées and it was erected in honor of those who died and fought in the French Revolution, as well as in the Napoleonic Wars. It is possible to climb on top for a small fee and enjoy a beautiful view. Technically speaking it was erected on a hill, so it is quite worth it. You can easily see La Défense and its spectacular modern architecture from here. 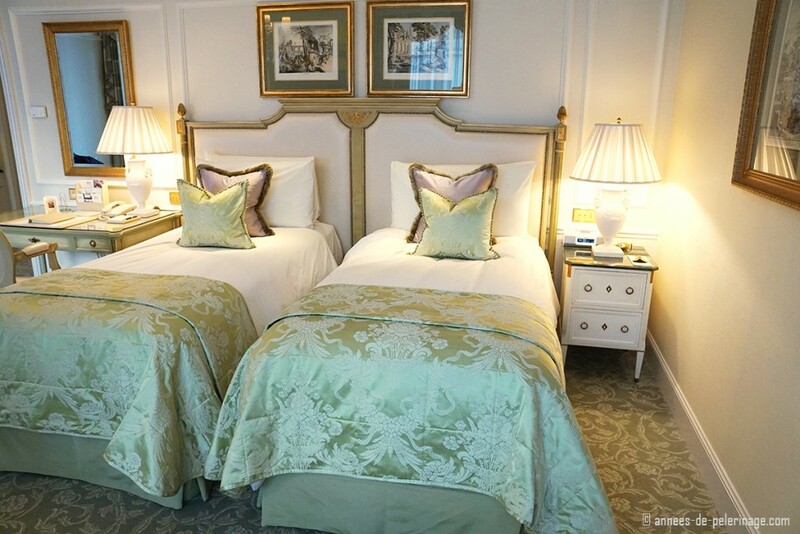 Personally speaking, I usually come here right after I arrive, because it is so close to the Four Seasons Hotel George V (where I am usually staying; absolutely check out my review of this spectacular luxury hotel). Seeing the Arc de Triomphe instills this feeling of being in Paris, making it real if you get my meaning. 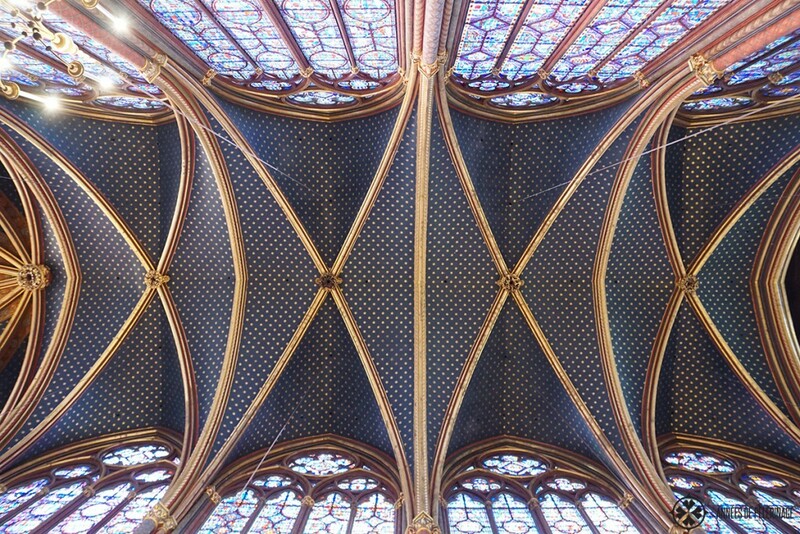 Words cannot describe the miracle called Sainte-Chapelle. 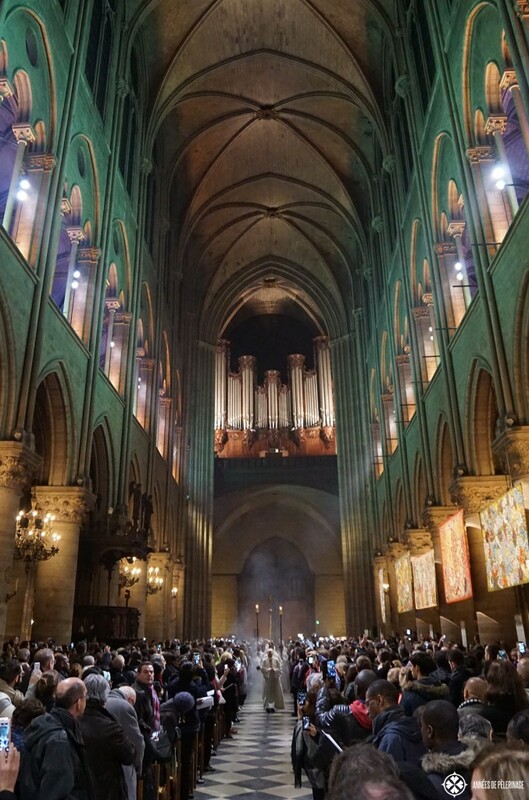 The two storied chapel is located right in the heart of Paris and only a short walk away from Notre-Dame. It dates back to the 12th century and is a prime example of Gothic architecture. It lies somewhat hidden inside the Conciergerie, so you will have to find the little entrance that takes you into the courtyard (follow the signs). 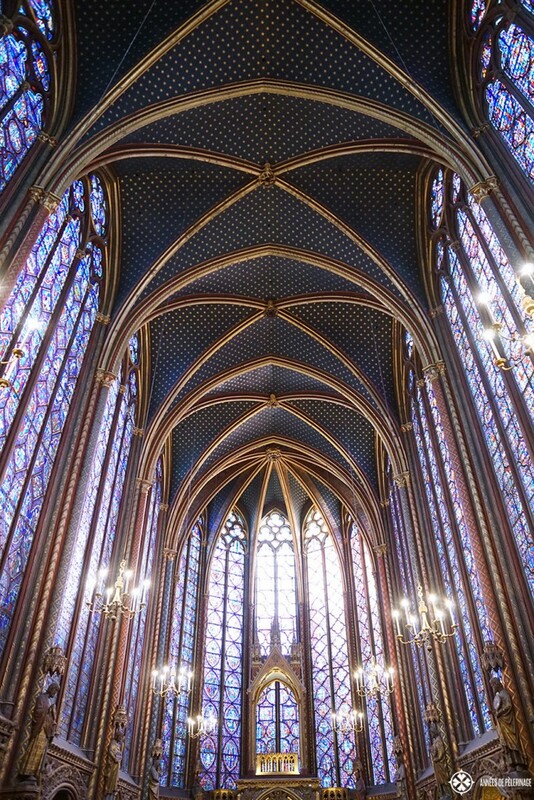 Two-thirds of the stained glass windows are actually original artworks from the time making them over 800 years old. The blue haze they create make you feel like standing in heaven itself (which probably was the very purpose to start with). Absolutely do go! Of all the things to do in Paris, this really is my favorite spot. The white turrets of the Basilique du Sacré-Coeur stand right at the summit of Montmartre and thus marks the highest point in the whole city. Its pristine color has always made it a tourist-magnet and I implore you to go. I don’t particularly like the insides, but the view from atop is spectacular. Also, the whole district of Montmartre, with its many bistros and shops, is just so lovely to walk through. In past centuries, many famous artists had their studies here (Dali, Money, Mondrian, Picasso, Vincent van Gogh, etc). So visiting Sacré-Coeurs is really a must thing to do in Paris. Don’t expect to take a lonely selfie, though. Paris is the perfect city for fashion and shopping. And probably nowhere in Europe will you find more prestigious brands in one spot than in the Galleries Lafayette. It is an ancient, yet gigantic mall. Finished in 1912, the dazzling Art Nouveau steel dome will blow your mind. If you come here for Christmas, you will get the chance to see the most amazing Christmas decoration this side of the universe. As for shopping – even if you don’t plan to spend a single centime it is still worth to go. Just breathe in that air of luxury and style. Absolutely make sure to get to the terrace on top of the building. 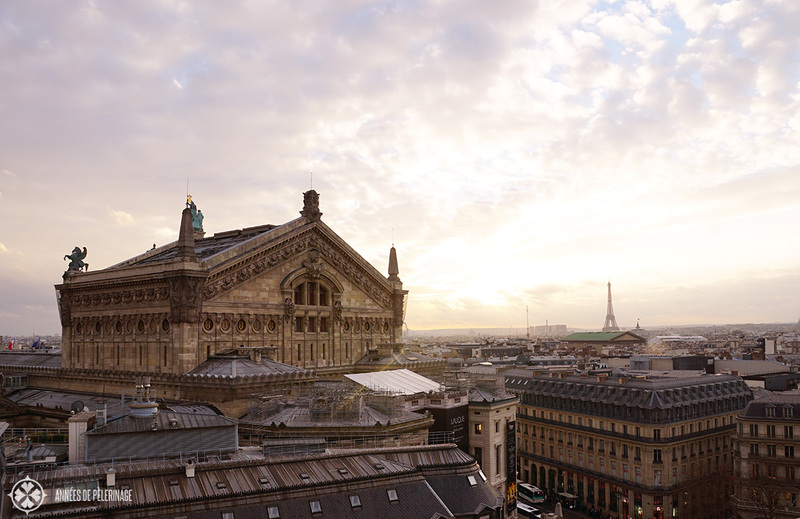 The view on the inner city (especially the Opéra Garnier) is absolutely breathtaking – and for free. 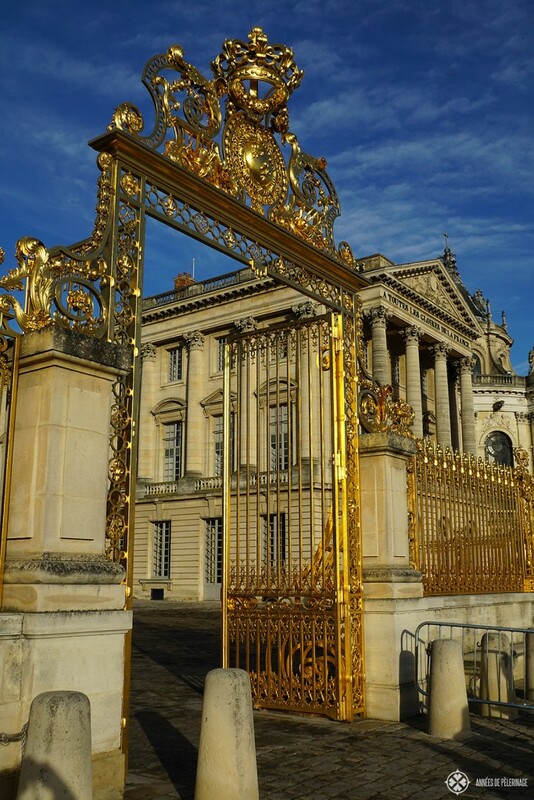 The Palace of Versailles is arguably one of the most beautiful castles in the world. It served as an architectonical role model for countless other castles all around the world and is just beyond amazing. Technically speaking Versailles is not located in Paris anymore but in a suburb of the selfsame name. But to be quite fair, it used to be the center of the French empire for over a hundred years so you really have to visit. All in all, you will need a full day to visit the castle and its surrounding parks (and more castles). It is well worth the time – especially because it combines walking through wonderful landscape gardens and getting an intimate glance into the archetype of royal splendor. New York may be the city that never sleeps, but Paris is the city that never stops to be beautiful. So don’t go to bed after dinner, but persuade yourself to get into those comfortable walking shoes again and explore the city at night. 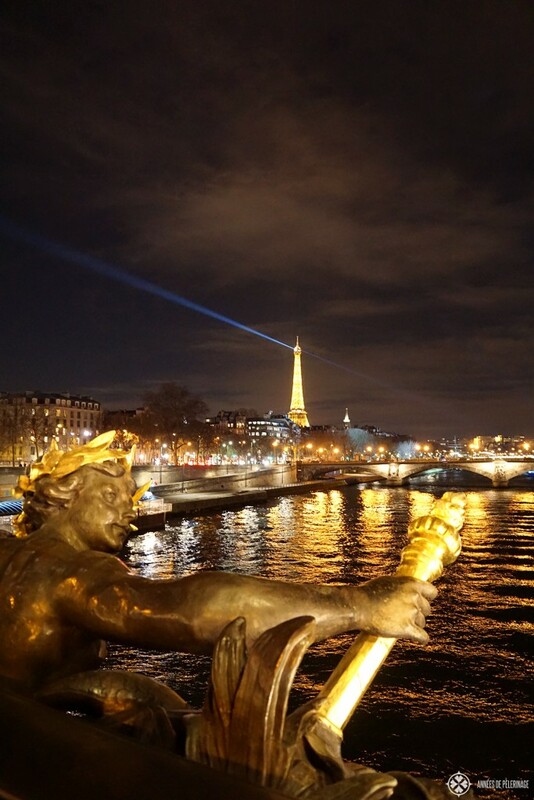 The Pont Alexandre III is my favorite spot to see Paris at night. And since the Eifel Tower is so beautiful lit, there really is no way you cannot fall in love with this city. 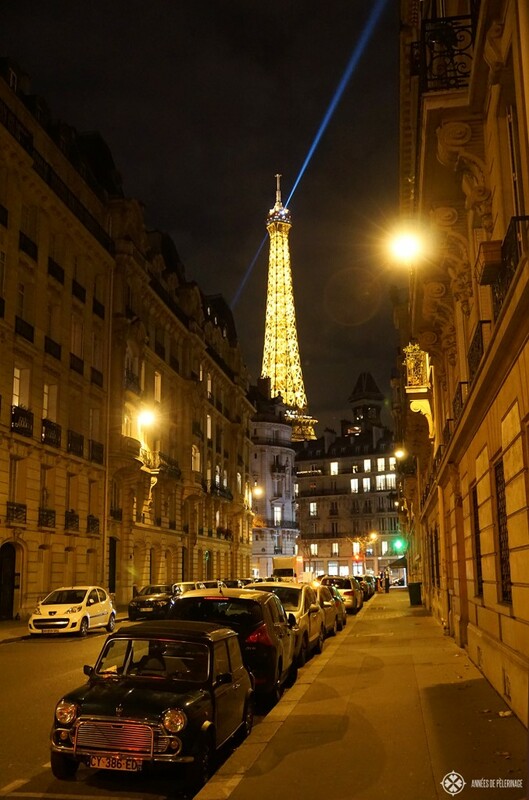 In all honesty, it does not matter where you go, but I’d stick to the 1st arrondissement (anywhere between Louvre and Arc de Triomphe will be perfect for your night walk). 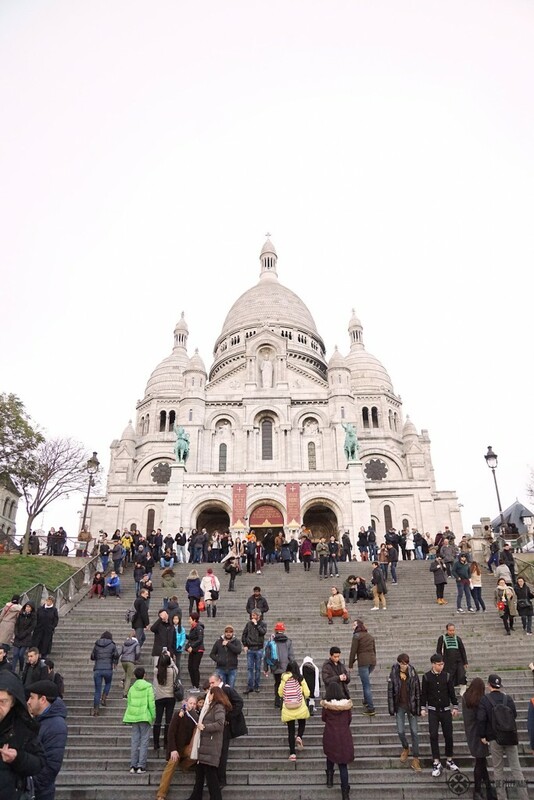 Most people will visit Montmartre because of Sacré-Coeur abutting it all. But don’t stop there and don’t stop after you had yourself a fabulous lunch or walked along the many artist studios. 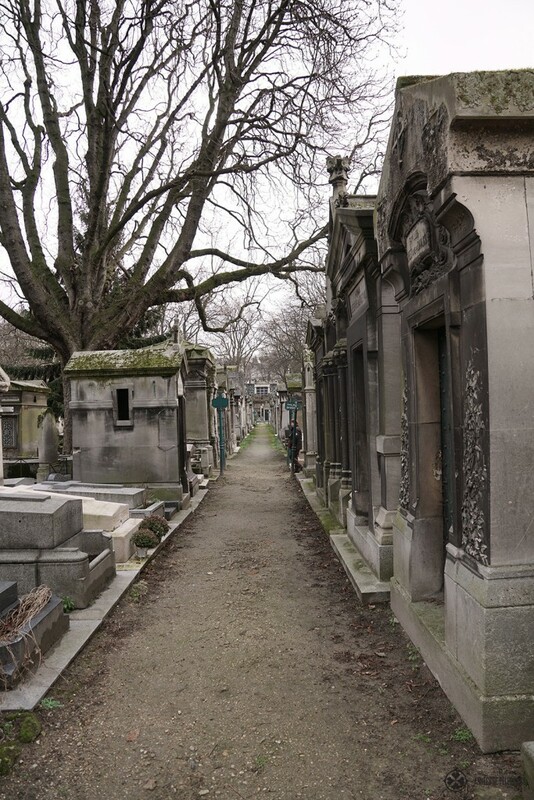 The graveyard of Montmartre might just be the secret highlight of this quartier. Many famous people have been buried here (just check it out on Wikipedia!). It might be a haunting place, but the tombs are beautiful in a very sinister way and should be on your list of things to do in Paris. I love Monet (well, who doesn’t). But I especially love his late, more abstract work. 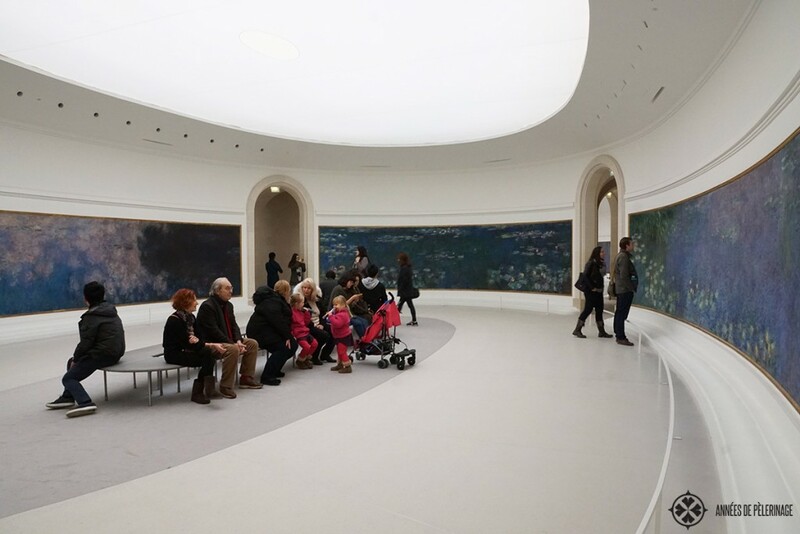 The Musée de L’Orangerie might just be the best spot on earth to appreciate that. Built right at the western corner of the Tuileries Garden (close to Place de la Concorde), the Museum is little else but two huge oval-shaped rooms housing 8 water-lily murals by Monet. If you are a fan of the Nymphéas, there really is no way around going to the Musée de L’Orangerie. Take a seat on one of the benches and explore the genius of the famous artist. I really have to confess that I love French cuisine. But I guess I am hardly alone there. Food in France is usually quite expensive, even more so in Paris. On a more positive note, there is a reason. The French lay a huge emphasis on the quality of the food, but also on the way it is served and presented. Naturally, an experience like that will cost a little extra. Quality is never cheap. 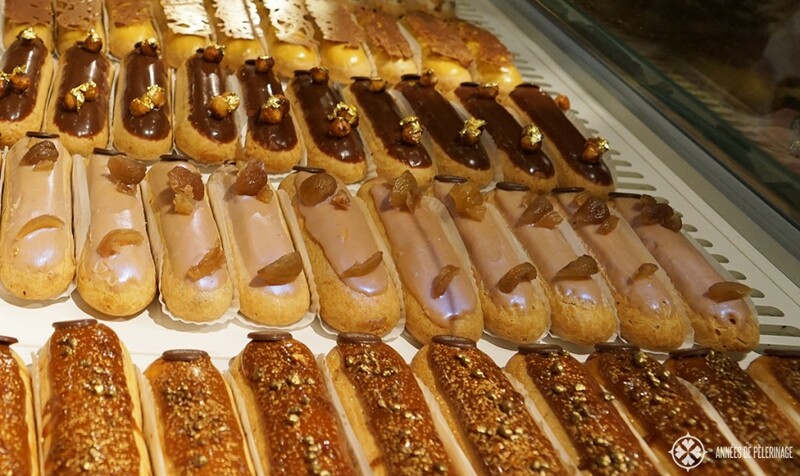 Make sure to sample one of the many traditional French dishes on your stay in Paris. 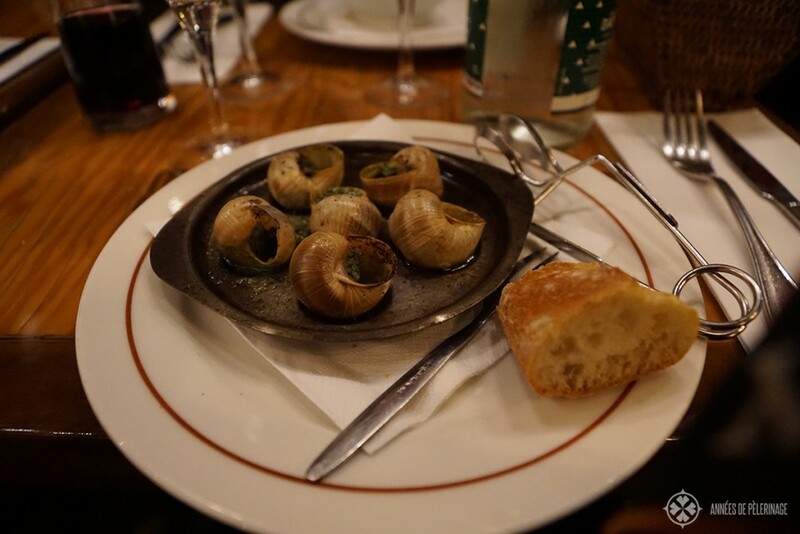 Snails (escargots) in herbal butter are my personal favorite. If you find the time, I also recommend you to drop by at one of the many Michelin star restaurants in Paris. These restaurants usually offer an almost surreal atmosphere and otherworldly menus (prices are also a bit otherworldly). Paul Bocuse, Alain Ducasse – there are so many vibrant names floating around that it is actually hard to take a pick. Remember to reserve your table way in advance. Also, remember that most Michelin Star restaurants have a dress code (usually black tie). I guess every regular visitor to Paris has a favorite quartier. For me it is Saint-Germain. Other love the Marais or the Latin Quarter. Paris is a city of many wonders and I do recommend you to go on a walking tour through one of the inner parts of the city. 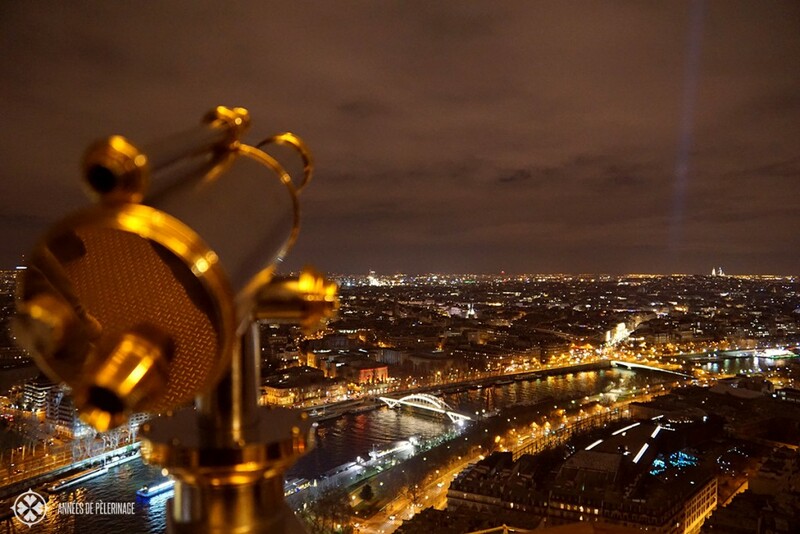 The things and views you will discover will make your visit to Paris so much more memorable. Don’t just stick to the highlights. I’ll tell you a “secret”: There is a river crossing through Paris. So on your visit to Paris, do make use of the Seine. 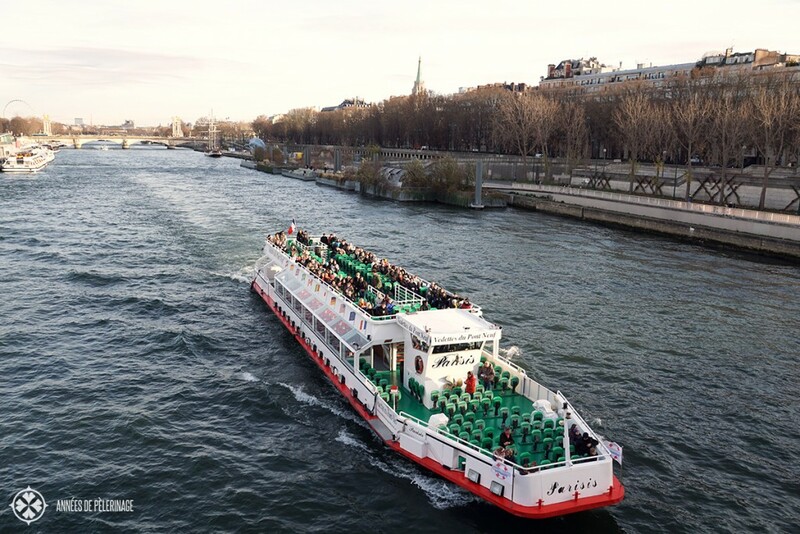 You will find many so-called Bateaux Mouches operating the river. For you, it means seeing the city from a whole new perspective. And since you will spend your days in Paris constantly walking, a little bit of rest is a welcome respite, eh? Usually, these boats also offer food and drink – so your boat ride has the potential to be quite romantic. My, this article got long! Still, I really couldn’t squeeze in all the fantastic sites in Paris. I recommend you to get a proper guidebook before visiting the city. As I always stress: It will be more than invaluable to have something off-line along on your travels. Here is a little selection – far from extensive. I can personally recommend the Rick Steves guide the most, but I guess it really depends on your personal preferences. Some people swear by Fodor’s, others are used to Lonelyplanet. Now having shown you all these beautiful spots, you might wonder where you can stay in Paris. Like most capital cities, Paris is not exactly cheap. In fact, it is outright expensive. 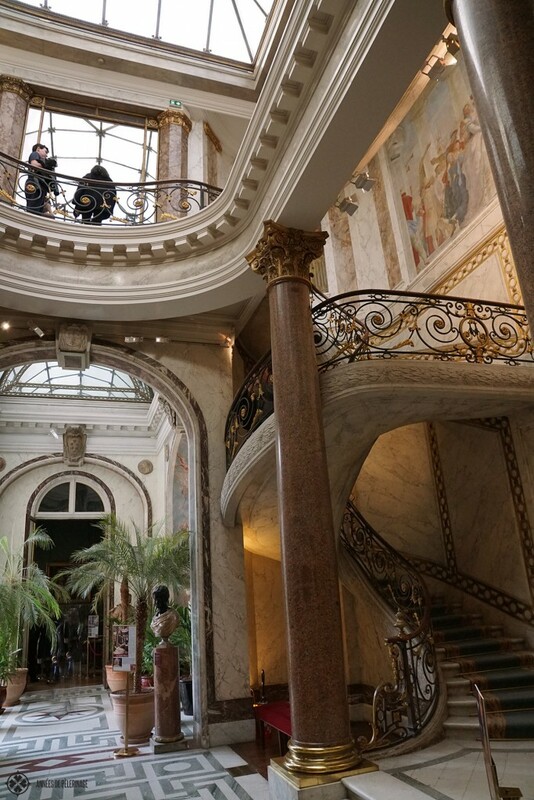 But just like the food, Paris is home to a couple of outstanding luxury hotels. Of course, you could also opt for an Airbnb alternative, but since Paris is such an intense city, I love to get pampered (okay to be quite truthful that has nothing to do with Paris, haha). Seriously: Having a wonderful spa to wash away the sores of a long day walking through the city of lights makes all the difference. Starting the day with an exceptional breakfast will give you the energy to start anew. I don’t really think the location of your hotel matters all that much, even though Paris is a huge city. An easy metro/RER access is probably more important. My favorite hotel is the Four Seasons Hotel George V. It is located right next to the Champs-Élysées and truly in the middle of everything. The hotel is just outstanding and probably Paris’ best. They have a wonderful spa with a lovely indoor pool and outstanding flower decorations! 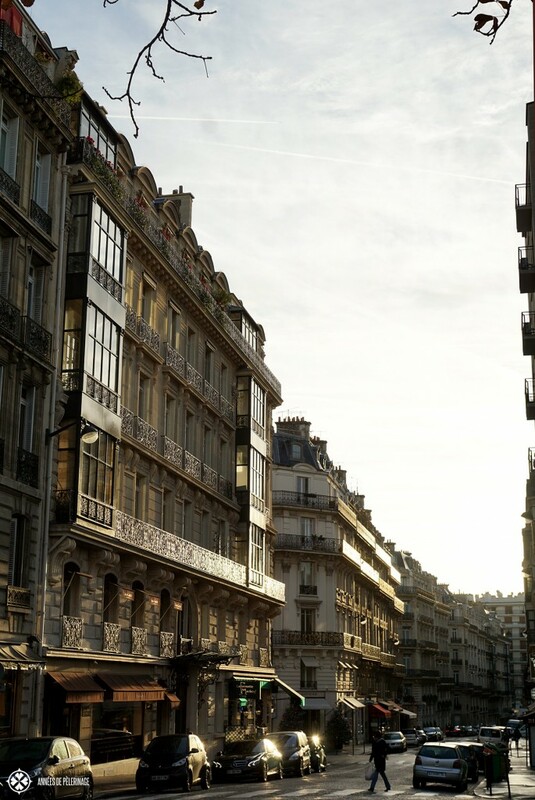 Right, next to the Jardin des Tuileries (with a beautiful view on Louvre AND Eifel Tower) you will find the Le Meurice – offering over-the-top luxury, amazing furnishing with a slightly modern twist. Absolutely stunning! 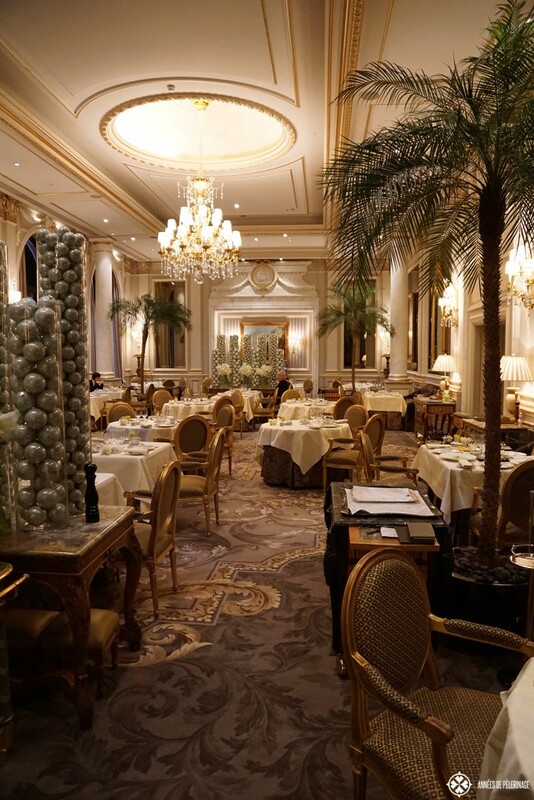 Sister hotel to the Le Meurice (also Dorchester Collection), the Palaza Athènée is home to one of the most outstanding restaurants on this side of the Universe by Alain Ducasse. The Ritz is a vibrant hotel name, that survived the ages unscathed. Alas, the hotel is still closed for extensive renovations (up until June 2016), so I really can’t recommend it. The last time I have been there was more than 10 years ago. 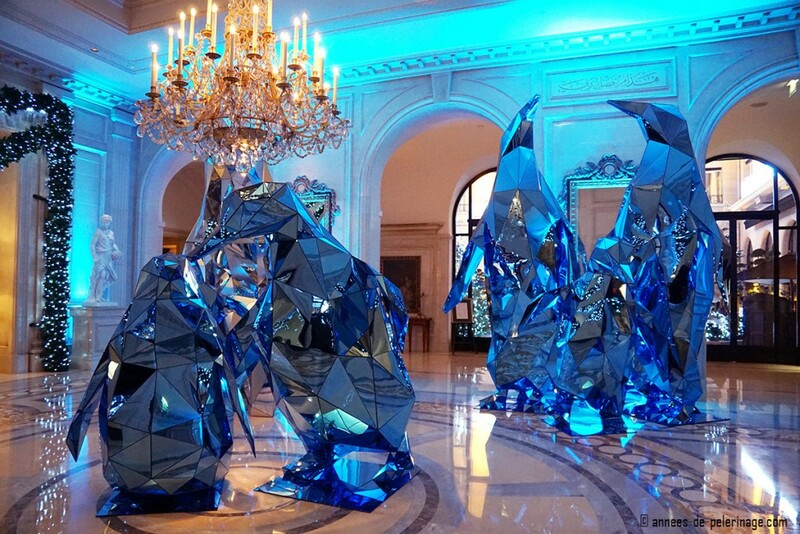 I am more than sure that the Ritz is trying to attain the top spot among the luxury hotels in Paris again! Paris is a mega-city and I do not recommend you to ever take the taxi during the peak season. Rather take the Metro or the RER (regional train) – it will be faster AND cheaper. If you are staying more than 3 days, I urge to get the Navigo Pass. For around 20 Euros you get unlimited train rides for 1 week. You can get it right at the airport at the ticket booth for the RER trains and will already take you to the city (need a passport photo). Do not get the Paris Pass. It is more than overpriced compared to the regular entrance fee and the Navigo Pass. The only exception would be if you are staying 1 full week and plan to see almost every museum. They advertise with getting into the museums without the queue, but like I said, you can simply buy them online. So that’s been it. This has been my list of things to do in Paris. Hope you enjoyed it. I would be more than glad to read about your favorite spots in Paris. Liked my article it? Why not share it! 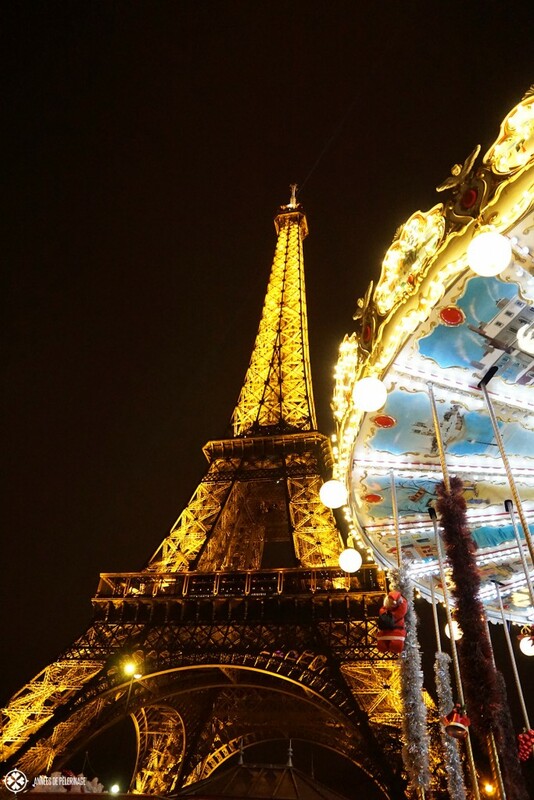 Download the pdf with 10 pages full of amazing tips for your trip to Paris. Your guide to the best photo spots in Paris. Success! Now check your email and download the pdf. Fantastic tips and I love all those beautiful hotels! Norman! Some great, great tips for Paris. I feel like there is always a reason to stay longer in Paris and always come back. So many fond memories! This was an incredibly helpful article! 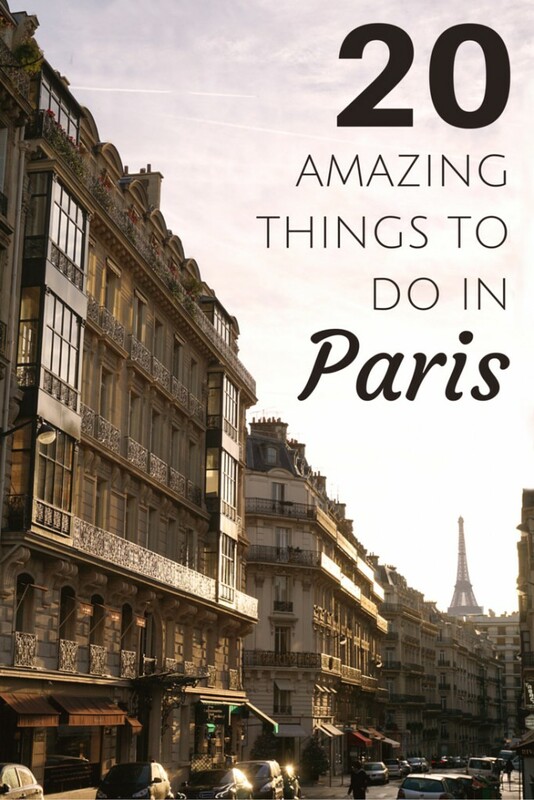 My husband and I are going to Paris in a few weeks and I’m putting some of the things mentioned here on our list! Thank you! What a helpful guide! Thank you for this. I will be using these tips on my upcoming honeymoon in Paris! Loved your article. Will be going in a couple of months. I am torn on the Paris Pass, though. I guess I need to look up each museum we plan on going to and see what it would cost to buy individually. 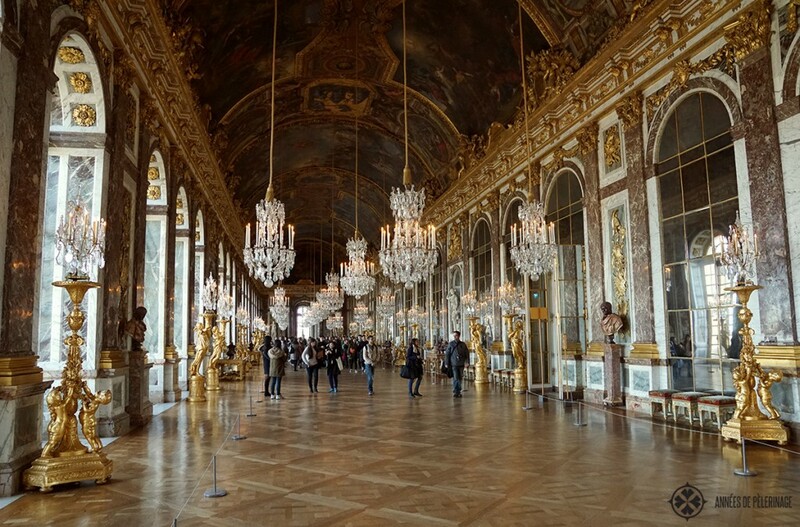 Personally speaking, I really vote against getting the Paris Pass…But then it really depends on the amount of time you want to spent in Paris and the number of museums you want to visit. It’S certainly easier to buy the pass once than buying all the individual tickets online.